A calf in Vermont has been born with two heads. Incredibly, she survived. Surprisingly, two heads, two snouts, and four eyes make for one photogenic calf. According to Kirstin Quesnel, the 75-pound calf, one of eight born on her Whiting, Vt., farm Tuesday, has one brain and would have been a twin if it had split properly inside its mother as an egg. Amazingly, the polycephalic calf -- which moos and eats with both heads -- appears to be in perfect heath. Although calves with extra heads or limbs have been born before, it's rare. In some cases, deformed calves do not survive. In an exceptional case earlier this year, a dairy farmer in New Zealand delivered a stillborn calf with eight legs, four ears, two bodies and one head. The farmer told New Zealand media that he originally thought he was delivering twins. 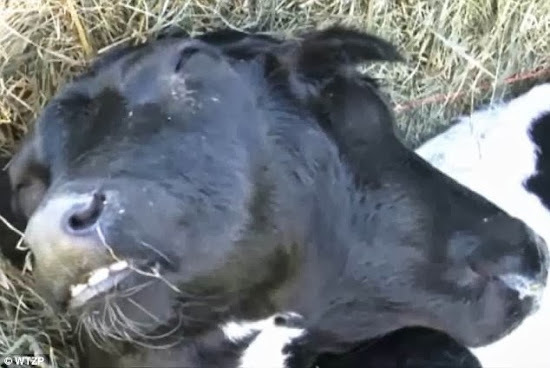 In January 2011, a two-headed cow was born in Georgia. 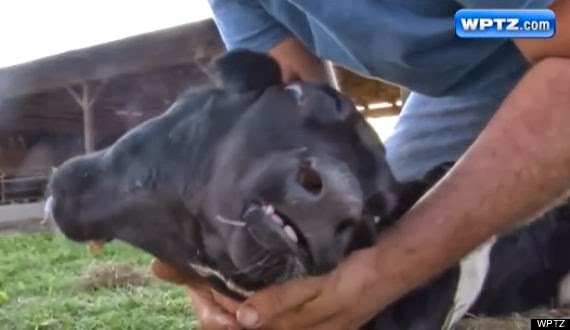 The farmer said that the animal ate with both heads -- just like the calf in Vermont. In 2012, a calf with an extra pair of legs was born in Switzerland. Although vets didn't initially think the six-legged cow had much chance of survival, the calf seemed to be doing just fine at two months old.